Seven Dragon Sanctuary: Sketchbook Cover 6? 7? who knows? Sketchbook Cover 6? 7? who knows? I really enjoy making covers for my new sketchbooks. I may have a new addiction. It is really difficult to not buy new sketchbooks like crazy just so I can make designs for them. I try to make them according to my "theme" for the month. This month I have been drawing horse skulls like crazy. The sketchbook was red, originally. I painted it with black gouache and a dry brush so that some of the red crackles would show through (I hope you can see the red a little bit). 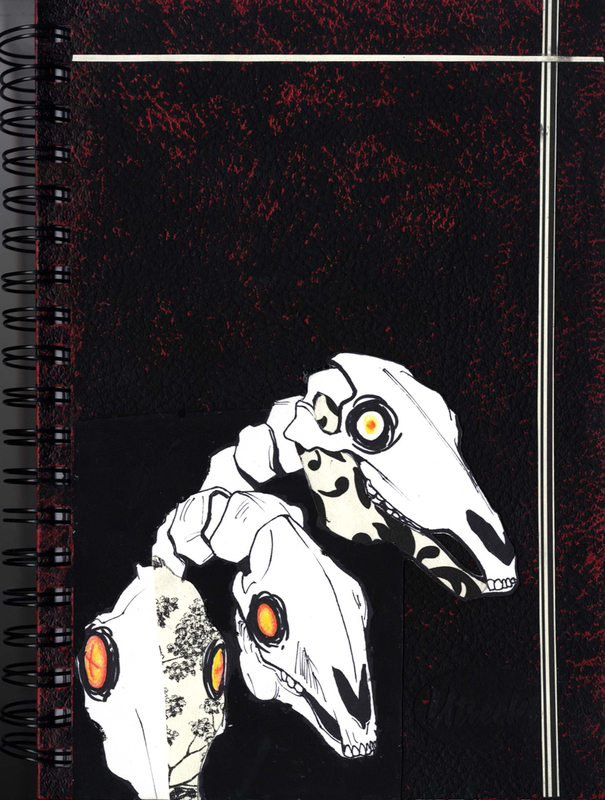 Then, I created the horse skulls with pen and sharpie and cut them out on another gouache colored sheet of Bristol board, then glued them onto the sketchbook with rubber cement (it holds onto hardcover sketchbooks very nicely). For the jaw and half-skull design, I cut shapes out of scrapbooking paper and to adhere it to the image, I used double sided tape. I found that for such small pieces, double-sided tape has the best... sticking power. I used tape for the cross-design as well. Finally, the skulls eyes were made using colored pencils.